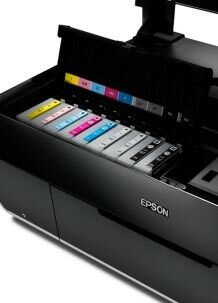 This page contain Epson Stylus Photo R3000 initial release info. and reports of its use. 4th At long last, our review is published. Looking at the R3000, the similarities to the SP3880 are quite noticeable. Same Ink set, screening and paper paths, but with a new design of smaller cartridges. Also different is the new 2 picolitre minimum drop size – the 3880 is very good and it has ‘only’ 3.5 pl minimum. I’ll be interested to see how this affects print quality and speed. If you add in roll paper support (up to 44″ is mentioned) and CD/DVD printing, this printer marks a distinct step up from the R2880 with its smaller cartridges, that physically move with the print head. Quite a few people I’ve spoken to, looking to buy a larger desktop printer, have thought about the 3880/2880 choice. Whilst the big prints and larger carts would be the decider for me (80ml cartridges in the 3880 against. 25.9ml cartridges in the R3000), many don’t have the print volume or space (or money) to go for the larger printer. If you look at the 3000, 3880, 4880 and 4900 together, you can see that Epson have a very solid presence in this size range. Whether their competitors see the gap (between ‘desktop’ and Large Format) as worthy of attack, should be interesting. 7th The R3000 is on display at the UK Focus on imaging show. We’re expecting to get our hands on one to test out this year. 17 January 2011 – Epson today launches its latest A3+ photo printer aimed at the professional and advanced amateur: the Epson Stylus Photo R3000. This printer makes professional-quality output accessible, with its convenient high-capacity inks which are perfect for medium print runs, and fits even the smallest desk space with its compact footprint. 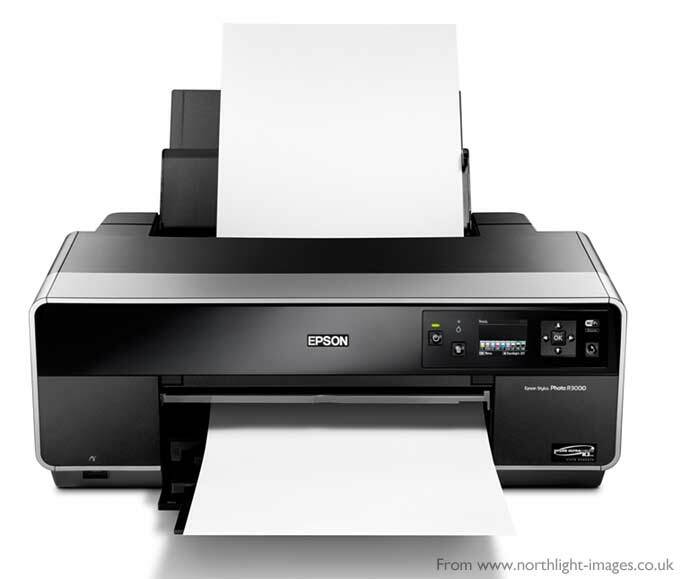 In response to photographers and designers’ feedback, Epson has developed the R3000’s new features with convenience in mind. A front-loading fine art paper feed makes insertion easier, reducing the likelihood of damage and removing the need for space behind the printer. Viewing media instructions and checking ink levels is simple with the 2.5-inch colour LCD. 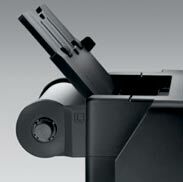 And the high-capacity, 25.9ml ink cartridges allow medium print runs to be completed while optimising cost per page. 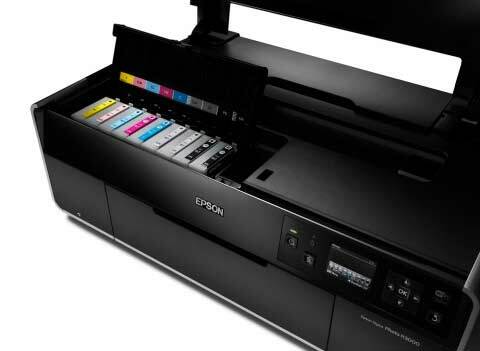 Epson’s reputation for superior photo quality combined with its advanced UltraChrome K3 with Vivid Magenta inkset means each print is consistently true-to-life. This inkset offers unbeatable greyscale reproduction – important for both colour and black and white prints – thanks to its three densities of black. Either a standard photo or matte black is employed and switched automatically by the printer to suit the media used, along with light black and light light black to create true black and white images. In addition to improving the grey balance and eliminating colour casts, this combination of blacks creates a smoother tonal range with a natural look, perfect for portraits. Users – whether they’re photographers, designers or architects – can also use the supplied professional-quality ICC profiles in their photo editing application to create professional-quality images that suit their unique style without relying on a lab. They can then focus on capturing the perfect shot, rather than having to learn print production skills. And with a high-quality A3+ photo taking just 195 seconds to print, they don’t then have to wait around to review the result. And the versatile R3000 allows printing on a variety of media, from roll to cut-sheet fine art paper and board up to 1.3mm thick, making it the ideal choice for total freedom of expression without compromising on quality. 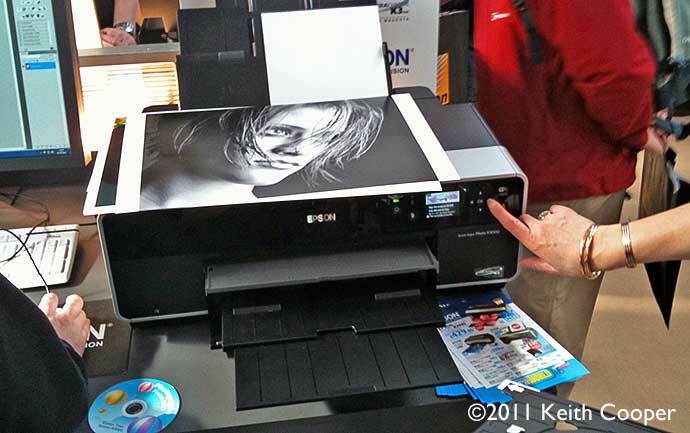 SAN ANTONIO (Imaging USA, Booth #200) – Jan. 17, 2011 – Epson America today introduced its most advanced 13-inch printer to date – the Epson Stylus Photo R3000. Designed for professional photographers and fine artists, the Epson Stylus Photo R3000 draws from the advanced technology of Epson Stylus Pro-series printers to deliver gallery-quality black-and-white output and vivid color prints. This printer also includes new features such as high-capacity individual ink cartridges, advanced media handling to support a wide range of paper types, and Ethernet and wireless-N connectivity. Featuring Epson UltraChrome K3 with Vivid Magenta ink technology and an advanced MicroPiezo AMC print head, the Epson Stylus Photo R3000 produces exhibition quality prints on a wide variety of glossy, matte and fine art papers up to 13-inches wide using advanced media handling capabilities. Its innovative pigment ink set delivers an extremely wide color gamut with more dramatic blues and violets, while AccuPhoto HD2 image technology provides smoother color transitions and better highlight and shadow detail. – Epson UltraChrome K3 with Vivid Magenta Ink: Professional eight-color ink set with Vivid Magenta and Vivid Light Magenta provides more dramatic blues and violets for an expanded color gamut. Built on Epson’s heritage of professional ink technology, this pigment ink set offers instant color stability and exceptional print permanence ratings for color and black-and-white prints. – Advanced Media Handling: In addition to a main top-loading, high-capacity tray, this printer features a new front-in, front-out media path designed for fine art media up to 1.3 mm thick, including Epson’s line of Signature Worthy papers. It also offers broad media support with BorderFree cut-sheet media handling, roll paper printing up to 44-inches long and CD/DVD printing. – AccuPhoto HD2 Image Technology: Created in collaboration with the Rochester Institute of Technology’s Munsell Color Science Laboratory, this complex mathematical architecture and advanced screening technology ensures precision placement of each individual ink droplet for smooth, grain-free images. This technology optimizes ink usage to maximize color gamut and provide smooth transitions and gradations, and reduces the metameric index to achieve consistent color under different lighting conditions. – MicroPiezo AMC Print Head: The eight-channel, high-precision print head produces a maximum resolution of 5670 x 1440 optimized dpi and variable-sized droplets as small as 2 picoliters and places them with precision and accuracy. For decreased maintenance and increased reliability, the print head also incorporates an ink repellent coating. – Intelligent High-Capacity Ink System: Nine individual 25.9 ml ink cartridges with pressurized ink technology ensures reliable ink delivery at all print speeds. 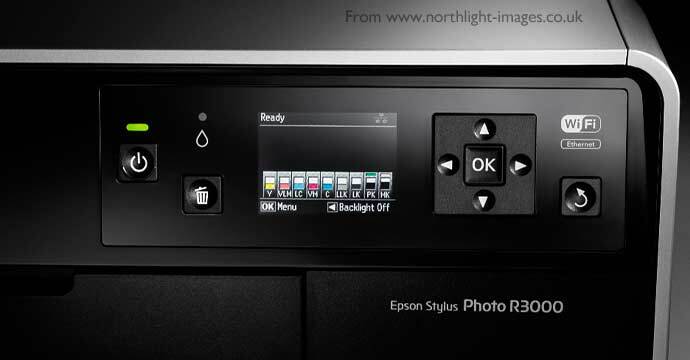 – Auto-switching Black Inks: The Epson Stylus Photo R3000 automatically switches between Photo and Matte black inks to produce the deepest blacks and richest color on glossy, matte or fine art media. – Unparalleled Connectivity: Built-in Ethernet, wireless 802.11n and Hi-Speed USB 2.0 provide flexible options for fast connectivity to multiple computers in a home or studio. – Advanced Black-and-White Photo Mode: Professionals can choose from one of four pre-set modes – neutral, warm, cool, or sepia for stunning neutral or toned black-and-white prints. This feature provides intuitive and consistent control through custom slider bars and a color tone wheel for advanced tone adjustment. In addition, customized settings can be saved and recalled to achieve consistent prints. 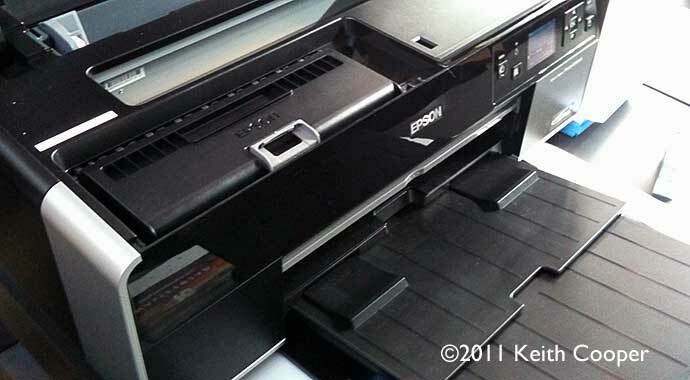 The Epson Stylus Photo R3000 will be available in March 2011 through authorized resellers for $849 (MSRP). The printer is supported by a one-year whole-unit exchange limited warranty plan and specialized technical support staff. The issue I am concerned with is whether this printer can print panoramas. I periodically want to print photographs at up to 2,000mm long. I have heard that many of the newer printers stop at around 1 metre and do a small skip at this point, making it useless for this purpose. 2. On the 2400 I have modified the waste ink drain to a extern tank. Is that also possible on the new one ? I´m not willing to send the printer to the service office if that type of message will appears after 2 years. 3. In case of trouble with the printer head, is it possible to change it by my self ? I hope that the Epson engineers had done there job. No sign of a replaceable maintenance tank in the specifications.